DELQA is open to the public August 6–9, 2015. Throughout history, from Bach to Björk, musicians have sought out technology as a means of adding new dimensions to their performances. Today, technology is also increasingly democratizing music, as the tools to create and share music are more accessible than ever. 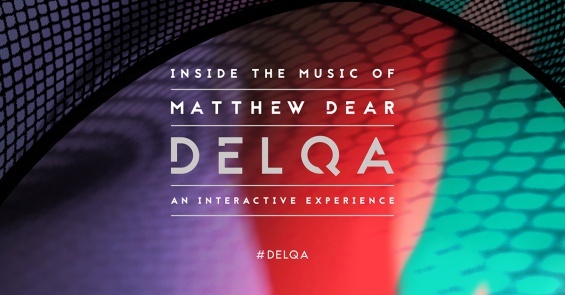 Facilitated by Microsoft Kinect technology, DELQA is a dynamic and immersive environment that pushes the relationship between music and technology by creating an intimate space that surrounds visitors with unique sounds and visuals. Critically acclaimed musician and producer Matthew Dear worked closely with a collective of NEW INC members—interactive developer Charlie Whitney, animator Philip Sierzega, music interaction and spatial sound team Dave Rife and Gabe Liberti, music interaction developer Yotam Mann, and environmental design team The Principals—to determine how visitors’ movements could transform their environment, blurring the lines between creator and audience.